Untangling America’s federal justice system can be a daunting task. No one knows how many federal laws are currently on the books. Many laws, including federal drug laws, have evolved and been amended over time – for better or worse. System failures continue to be documented even now. And accusations have been leveled across a variety of media that the justice and prison systems are a prime example of racial inequality. It’s this argument that caught our attention. 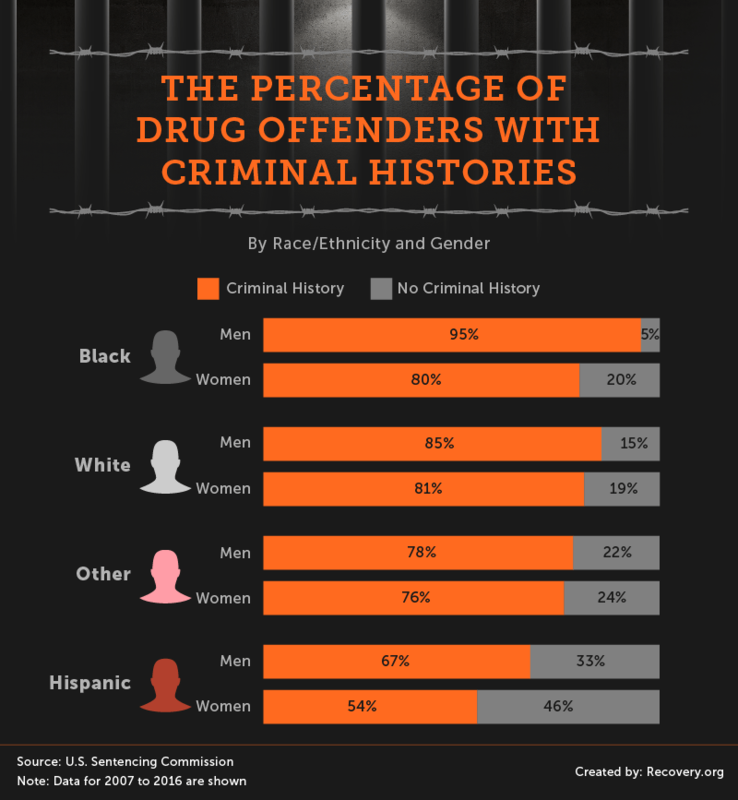 How is sentencing – and drug sentencing, in particular – impacted by race or gender? How does it compare state by state? And what story does the raw data tell us about the American justice system? To find out, we analyzed data from the U.S. Sentencing Commission on federal drug offenders from 2002 to 2016. Continue reading to learn more. 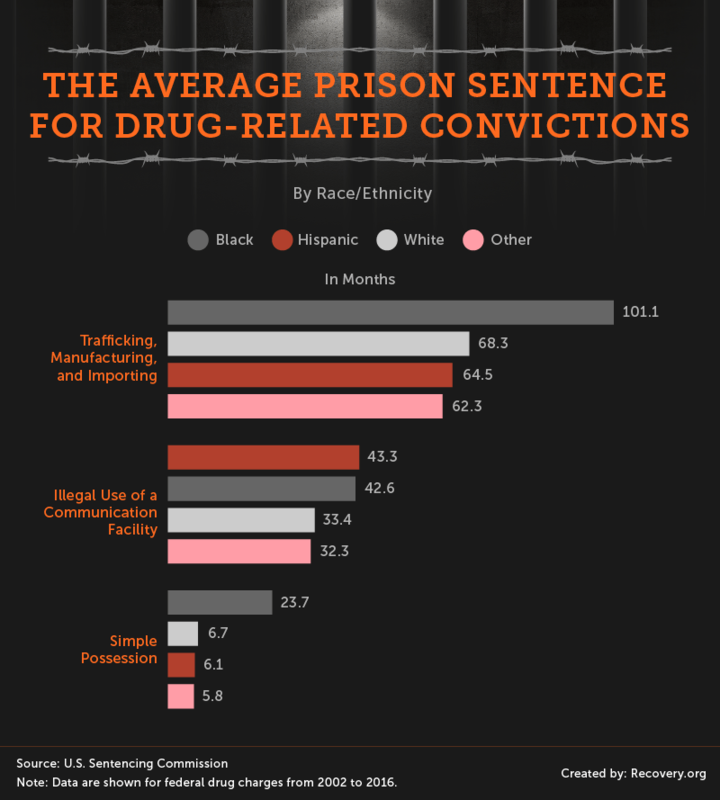 What’s the average prison sentence for each type of drug-related conviction – and does race factor into sentencing? Unfortunately, the answer is a resounding yes. Data from 2002 to 2016 show a stark difference between racial groups, with gaps most staggering for trafficking, manufacturing, and importing and simple possession. Black individuals charged with trafficking, manufacturing, and importing earned substantially longer sentences – about 39 percent longer – than any other group. For possession, sentences for black offenders were staggering yet again: nearly four times as long as Hispanic and white offenders. This could be connected to the fact that, until 2010, crack cocaine convictions earned sentences as much as 100 times as long as those for powdered cocaine, and crack cocaine offenders were black more often than not. When the data were filtered by drug type, the largest racial discrepancies appeared for crack cocaine convictions. In fact, sentences for black offenders were almost twice as long as that of white offenders when it came to the possession of crack. And Hispanic individuals only averaged around five months less than black offenders (about 16 months longer than white offenders). Meth is another drug with a substantial sentencing gap by race, with Hispanic offenders receiving almost twice as many months on average as white offenders. 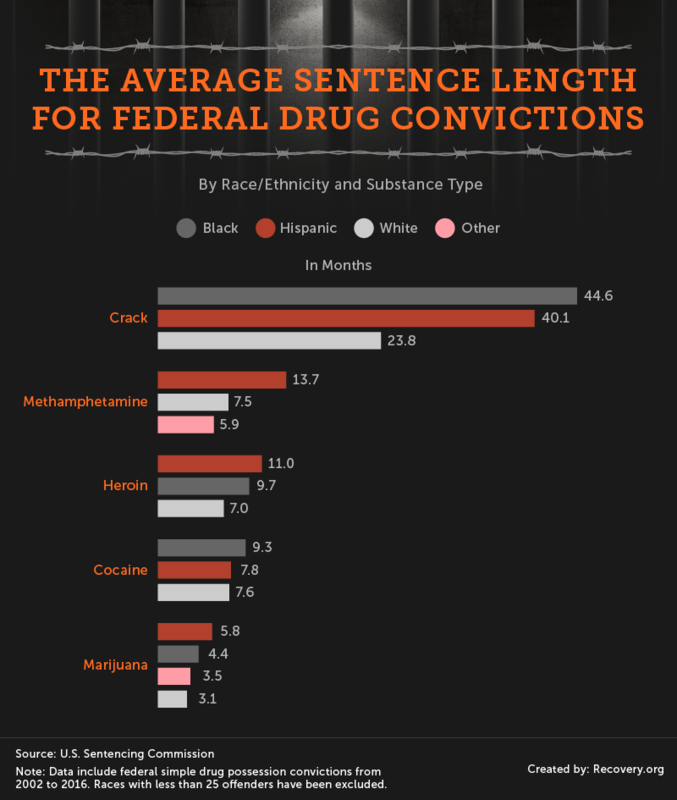 Interestingly, despite this sentencing gap, the fact is that only 9.2% of Hispanic individuals had used illicit drugs in the past month, compared to 10.2% of white respondents based on the 2015 National Survey on Drug Use and Health. While drug trafficking at the Mexican border has been on the decline for the last five years, the Southern border is still a common source of drug peddling (with about 1.5 million pounds of illicit substances seized at the border in 2015). Thus, it makes sense the largest number of federal drug convictions, on average, happen in Arizona and New Mexico. More surprising, however, is Vermont. The Northern state has one of the most disproportionate incarceration rates in the nation – with black residents making up just 1.2 percent of the state’s residency, but 10.7 percent of its jail and prison populations. Across the U.S., there are roughly .05 white inmates incarcerated for a drug offense for every 100,000 white residents. However, figures for other races or ethnicities aren’t nearly as small. For black offenders, Vermont, West Virginia, and Montana have unusually high conviction rates. 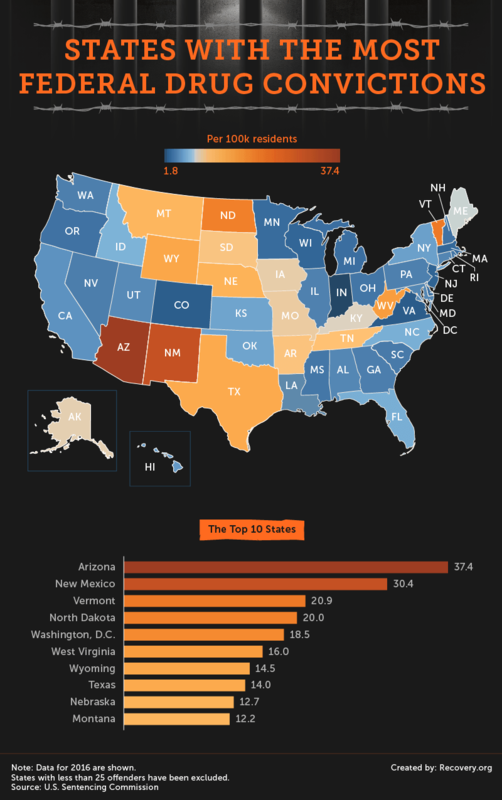 Vermont is also high for Hispanic offenders. And for other ethnicities, South Dakota, Montana, and Wyoming have the highest prevalence. 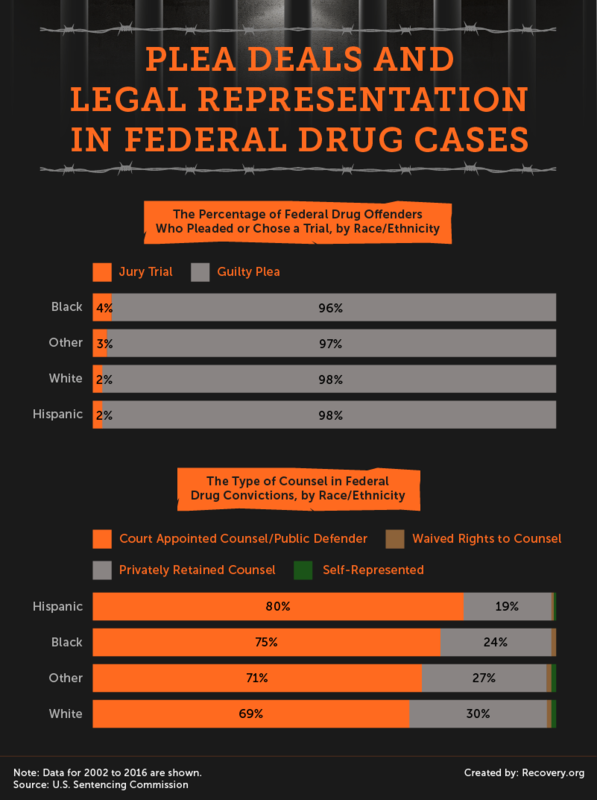 Approximately 97 percent of federal criminal cases in America end in plea bargains – a fact that is reflected by our data, which show less than 4 percent of any race or ethnic group goes to a jury trial. The group most likely to go to trial is African-Americans. The justice system relies on these plea bargains to keep things running smoothly; if every offender chose to go to trial, the already crowded court system would be overwhelmed and likely unable to function. Further, most people charged with drug offenses cannot afford private counsel. Over 69 percent are forced to use a court-appointed lawyer. The group most likely to hire a private lawyer is white defendants; the group least likely (at just 19 percent) is Hispanic individuals. Prison isn’t the only possible sentence for a convicted drug offender. Some are given probation, fined, or sentenced to community service. In light of our findings is the fact that sentencing varies by race or ethnicity. Of those eligible for non-prison sentences, white offenders were the least likely to be given prison time, while Hispanic offenders were the most likely (Hispanic men were about 50 percent more likely than white men to go to prison for a drug offense). Sentencing also varies by gender. Across almost every category (except “other”), women were more likely to avoid a prison sentence for a drug conviction. 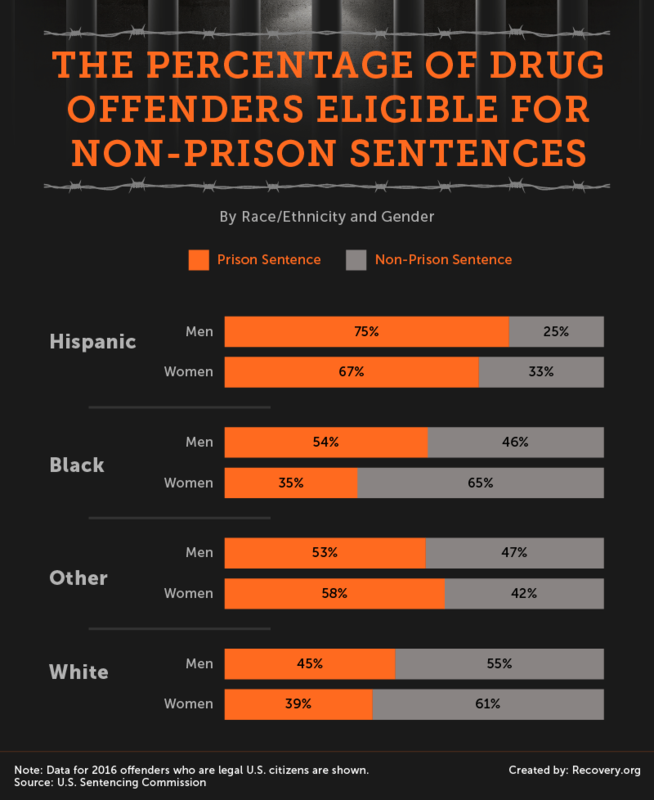 However, black women were the least likely to go to prison (35 percent compared to 39 percent of white women and 67 percent of Hispanic women). When we break down non-prison sentencing further and look only at simple possession charges, the racial gap becomes even clearer. 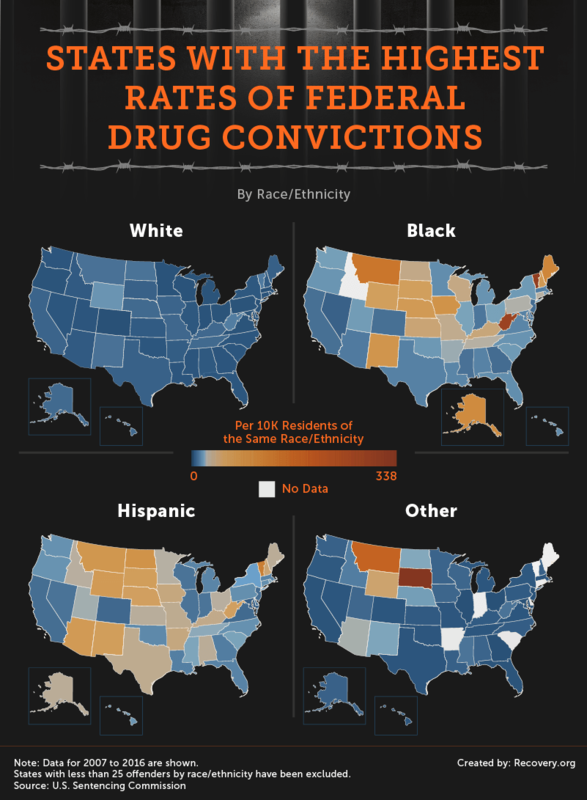 For Hispanic people accused of drug offenses, the only option a staggering 73 percent of the time was prison, compared to just 36 percent for white defendants, about 46 percent for black defendants, and nearly 52 percent for defendants of other races and ethnicities. White offenders were the most likely group to receive a fine only – with no probation or prison sentence attached. Fines are generally levied on first-time offenders charged with possession, while “intent to distribute” is subject to harsher sentences, so this disparity may have to do with the amount of drugs present or the police and prosecutors’ decisions on which charges to pursue. Though Hispanics were most likely to receive prison time than any other group, they were the least likely group to have an existing criminal history. Black offenders were most likely to have a criminal history. However, it’s not clear whether this is because black individuals tend to be repeat offenders or if racial profiling and harsher treatment of black Americans is partly to blame. Across all racial backgrounds, women were less likely to have a criminal history than men – a finding that tallies with research that shows women are substantially less likely to commit crimes than men. 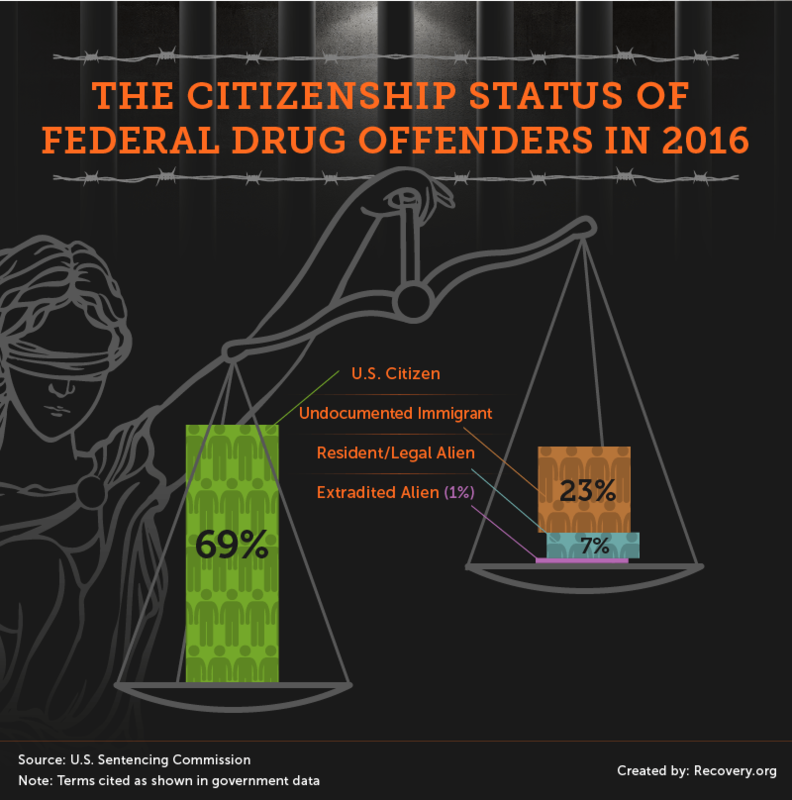 While debates rage on in the political sphere about the causes of drug crime in America, the data stand on their own: 69 percent of drug offenders are U.S. citizens, compared to 23 percent undocumented immigrants and 7 percent of legal residents. For some, this is compelling proof that immigrants are not the problem – at least when it comes to drug offenses – and that when it comes to crime, the focus of the government should not be diluted by immigration status profiling. Others may argue 23 percent is still too high of a number. But, according to an original data analysis from a 2010 American Community Survey, only about 1.6 percent of immigrant men aged 18 to 39 are incarcerated. Compared to the 3.3 percent of U.S.-born men within that age range in prison, the immigrant population appears much less likely than natural-born citizens to commit a crime. Also of note, even higher rates of illegal immigration do not coincide with increased crime. For drug offenders with criminal histories, the race gap appears to be shrinking. Before 2010, the average length of a sentence for black offenders was about 40 months more than any other group. After 2010, the gap between the longest and shortest sentenced group narrowed to 30, 20, and then 10 months. In 2016, black and white individuals were sentenced the same number of months, on average. For drug offenders with no previous criminal history, the data are a bit more complex. Until 2012, white offenders held the lowest averages – sometimes, like in 2009, by a large margin. However, until 2009, first-time black offenders had the longest sentences, averaging as much as 15 months more than their white counterparts. Hispanic offenders and those categorized as “other” fell somewhere in between. Historically, crack has been subject to harsher sentences than any other drug. In 2010, though, Congress passed the Fair Sentencing Act, which took crack from being punished at a 100:1 ratio compared to powdered cocaine down to an 18:1 ratio. 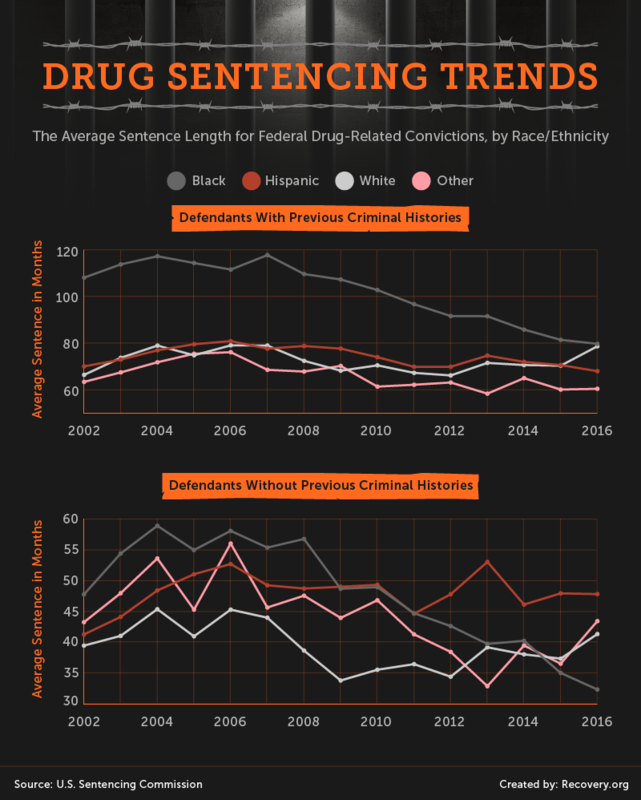 Because the majority of those arrested for possession of crack were black, this disproportionate sentencing impacted racial disparity numbers greatly, and the Fair Sentencing Act may be one of the major reasons the sentencing gap began to narrow that year. President Obama’s efforts to commute the sentences of nonviolent drug offenders may also have contributed to this narrowing. In 2012, the data shifted even further. By 2013, white and black offenders received the same average number of months, with first-time white offenders seeing an increase in sentencing and first-time black offenders seeing a decrease. First-time Hispanic offenders, meanwhile, saw a significant rise and had the longest average sentences in 2016, averaging about six months more than white offenders. With the current presidential administration pressing for harsher sentencing, drug crimes and sentencing trends are more relevant than ever. Even as racial gaps in sentencing start to equalize, penalties remain harsh, with average lengths of sentences for those with previous convictions hovering around 80 months (over 6.5 years) and 30 months (2.5 years) or 50 months (just over four years) for first-time offenders. If you’re faced with addiction, these might be some sobering facts. Even simple possession can land you in jail. If you, or someone you know, is struggling, now is the time to get help – not only to keep yourself legally free and clear, but also for the sake of your health, wellness, relationships, and happiness. If you’d like to know more, visit Recovery.org. We analyzed data from the U.S. Sentencing Commission for federal drug offenders from 2002 to 2016. We calculated the average sentence lengths in months by race. We excluded any data results that had less than 25 offenders as a sample size. For the maps, we used U.S. Census population data for state populations overall and by race. We then calculated the number of drug offenders per 10,000 residents for racial comparisons and by 100,000 for overall total offenders by state.